The 2012 Washington Nationals can and will be remembered in a few different ways. Some will see it as a successful season riddled with historic milestones achieved by a team who competed well beyond anyone’s spring training predictions. Others will remember it for the gut-wrenching two-run loss induced by a ninth inning collapse versus the World Champion St. Louis Cardinals in Game Five of the National League Division Series after being up 6-0. But maybe there’s a happy medium between the two extremes? Washington baseball in the modern era organically evolved into a devotion-based fan obsession upon the May inception of #Natitude. 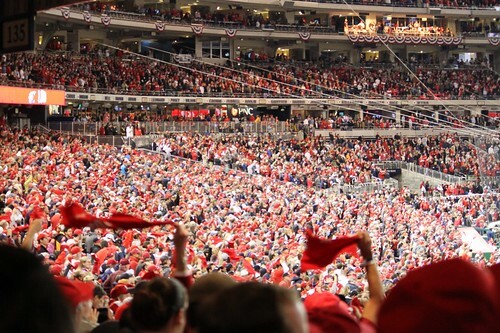 The play-on-words marketing strategy, endorsed by the Nationals’ Chief Operating Officer Andy Feffer, peaked people’s interest enough to follow the team on its journey toward becoming a contender. And this is all in addition to the incredibly devout season ticket holders and fans who’ve been supportive of the team since 2005 — the Nationals’ inaugural season. Since that time, the already active community of voices in support of the team on Twitter has increased in size, seats in the ballpark were filled willingly, and a Photoshop trend became the norm for expressing one’s thoughts surrounding the team and its players. Record attendance numbers and television ratings were tallied. The Nats made it to the playoffs for the first time in team history. These are all positive changes when compared to season’s past. It’s undeniable that something special took place at Nats Park this year despite the outcome of Friday’s playoff elimination. The team fielded by General Manager Mike Rizzo put their full potential on display which is something that Manager Davey Johnson insisted would occur since his first season as skipper last year. They then went on to win a total of 100 games (including two in the postseason) as well as the National League East division title. This is progress. 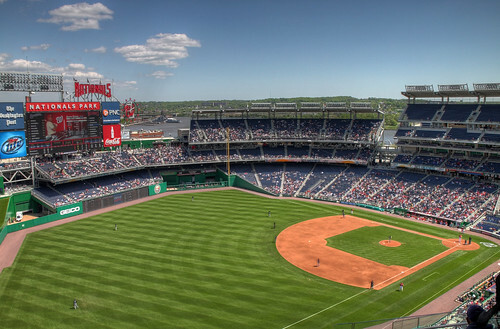 The 2012 Nats gave the greater Washington, D.C. area a reason to fall in love with baseball. Some residents of this transient city may have already had the capacity within their hearts to love this new team upon its move from Montreal to Washington in 2005, but the majority of folks still needed a reason to care. That’s legitimate. Those who watch baseball with a romantic’s eye are the ones who’ve fully explored the context of a team’s history, present, and proposed future. This was evident during Game Five of the National League Division Series. Washington was one out away from moving on to the National League Championship Series five times during the ninth inning of Friday night’s game. They were one out away from extending a season that went well beyond anyone’s expectations and they let it slip away. Hearts were left broken both on and off the field. But it should be noted that this team held steady for the duration of the season, a feat that helped them record the best record in all of baseball and their first-ever National League East division title. Playoff baseball returned to the Nation’s Capital for the first time since 1933 on Wednesday and left in a hurry come Friday. The good news is the roster is built for years worth of success beyond this one. It’s okay for your baseball-loving heart to ache today if you spent 2012 falling in love with Nationals baseball. What happened Friday night against St. Louis was of heartbreaking proportions. Just don’t let that affect your outlook on this historic season in Washington. I walked up the stairs at Nats Park, and walked out into the cold October night right after the last out was recorded. I couldn’t bear to watch the Cardinals rejoice. I had sat the whole game in front of their friends and family block, and listened as they’d shouted themselves raw in the 9th. I walked up First Street, through the middle of traffic. I could hear the truck behind me honking, but it just didn’t register. I walked for blocks and blocks and blocks. I got in my car and shut the radio off before I heard anything, knowing that whatever was being said on the flagship station wasn’t going to be comforting. No, this one is going to hurt for a while. By now, you’ve read Joe Drugan’s reaction, or Dave Nichols’ piece, or Rob Pegoraro’s take on the loss. There are many out there, but know that your own story and your own method of dealing with this loss are a part of it. When I was ten, I watched Dennis Eckersley give up the famous homer to Kirk Gibson in the 1988 World Series, and it still brings me pain. But, each time I see it, I also see, the very next frame in my mental memory bank is the team that won the very next year. The curtain fell last night, and Natstown appears to be in despair. On to the next act. Much of the Nationals’ roster is under team control through 2013. There is no team to dismantle, only one that can be made stronger. Faith, Natstown. Faith. Congratulations to the 2012 NL East Champion Nationals, their owners the Lerner Family and their partners, their GM Mike Rizzo, who put together the team that we saw, and thanks to Kyle Brostowitz, Mike Gazda & John Dever in the Nationals Media Relations department, who let us watch from the wings and tell you all about it. The heartbreak, as you say, is tempered with the fact we are young and players are locked up, and with two wild cards in the league, we have a good chance of making the playoffs in the next handful of years. Some say the Nats exit scarred them. I say it is a punch in the gut. Hurts bad right now, but come ST, we will be ready for another run. Thanks for the shout-out. There are some days as a writer when the best and only thing you can do is help people make sense of their pain; I hope that post did its part. They better get their winning ways going while the players are under contract. The Yankees are going to need to rebuild over the next few years, and the big money will beckon for a lot of current Nats.